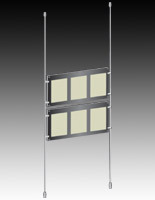 Backlit Frames Sell with Cable Systems Included for Creating Ceiling-to-Floor Sign Matrixes! Each Sign Panel has a Thin, Two-Panel Acrylic Construction! These Backlit Frames, Similar to Light Boxes, Illuminate Graphics for a Captivating Effect! Backlit frames constructed from two thin acrylic panels form an illuminated sign less than 1/2" thick. 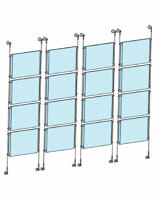 Ceiling-to-floor cable system is a unique and stylish way to suspend graphics in storefront windows. Silver cable system components stylishly contrast with the black face of the backlit frames. These backlit frames, similar to light boxes, illuminate graphics printed on translucent materials in order to attract an increased amount of market exposure and visibility. Not only will the bright LED illumination draw customers' attention, but the unique way in which these signage panels are suspended in midair will also help ensure this sign matrix will entice potential customers to become repeat patrons! This matrix of backlit frames comes with coils of 16' long steel wire, decorative panel clamps, as well as ceiling and floor mounts. Each signage fixture has an aluminum construction with a stain silver finish. The backlit frames have a black face, which contrasts with the cable system in a way that gives the matrix a very modern look. Each sign panel consists of two acrylic panels fixed together with decorative black hardware. 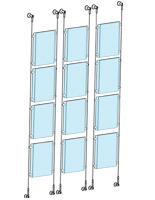 These sign matrices are backlit frames that have backers with illuminated beveled edges. The acrylic overlay has an opaque black border that deflects the edge lighting. The result is a soft glow around each of the acrylic backlit frames. Businesses will find the LED lighting of these sign panels provide two distinct advantages over neon signage or light boxes with florescent bulbs. 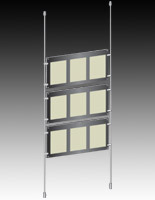 First, these backlit frames that are arranged in matrixes will save users money on power costs. The second benefit of the LED illumination is a reduced carbon footprint. Today's consumers are ever more environmentally conscious, so the positive public relations aspect of utilizing these window displays instead of neon light boxes should not be under estimated.